LEWISBURG - James Edward "Eddie" Guffy, 61, of Lewisubrg, formerly of Beechmont, died Tuesday, September 18, 2018, at 6:05PM at Norton Hospital in Louisville. Mr. Guffy was born February 27, 1957, to the late James Horace and Mary Louise Rhoades Guffy. In addition to his parents, he was also preceded in death by his sister, Judy Revlette. Eddie served his country in the U.S. Army. He was an over-the-road truck driver and later a heavy equipment operator in the coal mines. He enjoyed his grandchildren, singing, horses, woodworking, and riding his motorcycle. He was a member of Mercer Baptist Church and for many years led Celebrate Recovery there. Eddie was known by all as a great friend. 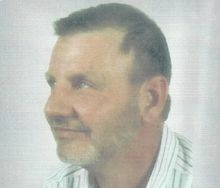 He is survived by his wife, Kathy Crafton Guffy; daughter Heather (Mike) Melton of Manitou; son Chad (Brooke) Guffy of Greenville; five grandchildren, Lane (Erika) Shepherd, Destiny Shaw, and Dawson, Isaiah, and Brock Guffy; great-grandchildren Landry and son-to-be born Laney Shepherd; brothers Michael (Rosemary) Guffy, David (Kim) Guffy, and Tim (Selina) Guffy; and numerous aunts, uncles, cousins, nieces, nephews, and friends. Funeral services will be Friday, September 21, 2018, at 2:00PM at Tucker Beechmont Funeral Home, with Rev. Curtis McGehee officiating. Burial in Bell Cemetery in Belton. Visitation will be Thursday after 5:00PM at the funeral home. Online condolences may be made at www.tuckerfuneralhomes.com.